Abstract. The Chinese Spring Festival (CSF, also known as the Chinese New Year or Lunar New Year) is the most important festival in China. Lunar New Year's Day (LNYD) is the first day of the Lunar New Year. Traditionally, the CSF holiday begins a couple of days before LNYD and ends on lantern day, lasting for approximately 2 weeks. 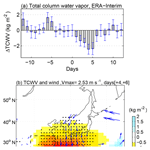 In this paper, based on the long-term station observations from 1979 to 2012, the precipitation during the holiday over southern China (108–123°E and 21–33°N, 155 stations) tends to be lower than that before and after the holiday. The mean precipitation frequency anomaly from the fourth day to the sixth day after LNYD (i.e., days [+4, +6]) decreases by −7.4%. Simultaneously, the daily precipitation amount experiences a reduction of −0.62mm day−1 during days [+2, +5]. The holiday precipitation anomalies are strongly linked to the anomalies of relative humidity (ΔRH) and cloud cover. The station observations of the ΔRH show an evident decrease from day +2 to day +7, and a minimum appears on days [+4, +6], with a mean of −3.9%. The ΔRH vertical profile displays significant drying below approximately 800hPa. Between 800 and 1000hPa, the mean ΔRH is −3.9%. The observed station daytime low cloud cover (LCC) evidently decreases by −6.1% during days [+4, +6]. Meanwhile, the ERA-Interim daily LCC also shows a comparable reduction of −5.0%. The anomalous relative humidity is mainly caused by the decreased water vapor in the lower-middle troposphere. Evident negative specific humidity anomalies persist from day −3 to day +7 in the station observations. The average specific humidity anomaly for days [+4, +6] is −0.73g kg−1. When the precipitation days are excluded, the anomaly remains significant at −0.46g kg−1. A significant water vapor deficit is observed in the lower troposphere below 700hPa. Between 800 and 1000hPa, the mean specific humidity drops by −0.70g kg−1. This drier lower-middle troposphere is due to anomalous northerly winds, which are closely related to the cyclonic circulation anomaly over the northwestern Pacific. The time-lag correlation demonstrates that approximately 1 week after a lower temperature occurs over eastern China, a stronger cyclone is observed over the western Pacific. The possible mechanism needs further clarification through elaborate observation and numerical modeling. How to cite: Zhang, J., Gong, D.-Y., Mao, R., Yang, J., Zhang, Z., and Qian, Y.: Anomalous holiday precipitation over southern China, Atmos. Chem. Phys., 18, 16775-16791, https://doi.org/10.5194/acp-18-16775-2018, 2018. The Chinese Spring Festival (also known as the Chinese New Year or Lunar New Year) is the most important festival in China. This paper reports that during the Chinese Spring Festival, the precipitation over southern China has been significantly reduced. The precipitation reduction is due to anomalous northerly winds. We suppose that anomalous atmospheric circulation is likely related to the human activity during holidays. It is an interesting phenomenon.